The People’s Majlis has notified vice president Dr Mohamed Jameel Ahmed of a resolution calling for his removal, and granted him 14 days to respond to charges. The notice was sent on June 30. Jameel must respond orally or in writing by July 13. The motion to impeach has not been placed on the Majlis agenda yet, secretary general Ahmed Mohamed said. The ruling Progressive Party of Maldives (PPM) had secured 61 signatures on the impeachment motion. A two-thirds majority or 57 votes of the 85-member house is required to remove the president or the vice president. Jameel is in London at present. PPM MPs have said that President Abdulla Yameen has ordered his deputy to return and answer the charges. But Jameel told an Indian newspaper that he had obtained permission before travelling to the UK for a human rights seminar. The parliament has changed its standing orders to fast-track the process of impeaching the vice president. The new rules state the Majlis can vote on the vice president’s impeachment without an investigation by a select committee. 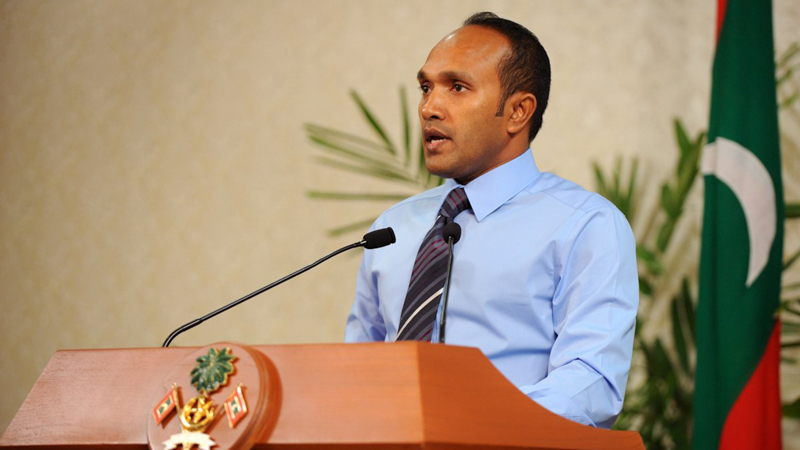 Jameel has called his party’s attempts to remove him a “constitution coup,” and suggested that the international community should intervene. PPM MPs have publicly accused Jameel of disloyalty and incompetence and are seeking to replace Jameel with tourism minister Ahmed Adeeb. Responding to Jameel’s allegations, Adeeb told Haveeru that Jameel had fled the Maldives after a failed coup attempt. “A lot of people are accusing him of leaving with a lot of money and a lot of things. He is even now accused of dereliction of duty and fleeing the country. He has left the country because the coup he had planned has failed,” he said. Adeeb also slammed Jameel’s call for help from the international community. Minivan News was unable to reach Jameel at the time of going to press. Jameel had kept silent on the petition for impeachment, but released a statement on Twitter on Tuesday, in which he accused the PPM parliamentary group of greed and said that MPs have arbitrarily amended the constitution for their personal interests. The parliament last week passed the first amendment to the constitution with overwhelming multi-party consensus to set the new age limits of 30-65 years for the presidency and vice presidency. Adeeb is now 33. The constitution previously stated that candidates must be 35 years of age. The opposition’s backing for the amendment is widely perceived to be a deal made in exchange for jailed ex-president Mohamed Nasheed’s transfer to house arrest. The government and Nasheed’s Maldivian Democratic Party (MDP) are now preparing to begin talks to end a six-month long political crisis. Vice President Dr Mohamed Jameel Ahmed has stated that truly loving a child is to refrain from inflicting physical harm on the child in the name religion and culture, and from committing sexual harassment against children on the pretext of providing an Islamic upbringing. Speaking at an event held in the National Art Gallery on Monday (October 15) to inaugurate the Minstry of Law and Gender’s new programmes, Jameel emphasised the importance of protecting the rights of children. The new programmes focus on providing services for women, children, the elderly and people with special needs. Jameel described the ministry’s programme as an effort to establish Maldives as the country in the region in which most fundamental rights are protected. He went on to say that it is imperative that children are not discriminated based on their gender, and that they are not deprived of any educational opportunities or health benefits, local media reports. Jameel opined that those who need social protection should not be perceived as a burden on the state, before using examples from Islamic history to demonstrate how society benefits from these people. The gender ministry’s programme includes the release of two books regarding internet safety, the introduction of a domestic violence database, formulation of regulations for the establishment of day care centres, and home care services for the elderly. Additionally, employment letters were also handed over to two persons with special needs. The two job placements are at Fenaka Corporation and Island Aviation Services. The Maldivian government’s respect for freedom of religion has declined in the past year, according to the US State Department’s 2012 Report on International Religious Freedom. The report highlighted “increasing reports of abuses of religious freedom, religious intolerance and governmental restriction of religious freedom and pressure to conform to a stricter interpretation of Islamic practices” in the Maldives. The report concluded these concerns were especially relevant after the controversial transfer of power in February 2012. Pointing out that the Constitution of the Maldives and other laws and regulations restricted freedom of religion, the report found the government to have enforced these in practice. “The law prohibits citizens’ practice of any religion other than Islam and requires the government to exert control over all religious matters, including the practice of Islam. There were reports of societal abuses and discrimination based on religious affiliation, belief or practice,” the findings reported. The report added that according to government records, all 350,800 citizens are required to be Muslim, with the majority of this number practicing Sunni Islam. Non-Muslim visitors to the country are only allowed to practice their religion in private, it added. The US issued study claimed there was also an increase in reports of abuse of religious freedom, ranging from detention of individuals to pressure to conform to a stricter interpretation of the religion. Pointing out that conversion to Islam from another religion can lead to the rescinding of the convert’s citizenship, the report stated that no such incidences were reported in 2012. “The government subjected individuals who made public calls for religious tolerance to extended extrajudicial police detention”, the US State Department said in the report. It added that the government had also “deported individuals found with Christian images” while detaining “several individuals for periods of several weeks on charges of ‘anti Islamic’ behaviour before releasing or deporting them”. The report found that the government continued to control all religious matters, mainly through its Ministry of Islamic Affairs. The US State Department noted a number of incidences that occurred in 2012 to back its findings. These included a government ban on discos and the deployment of police to conduct patrols to close down ‘unauthorised gatherings’. It also refers to the mob attack on the National Museum, which saw pre-Islamic artifacts destroyed. The attack occurred at the time of last year’s controversial power transfer on February 7. “The ministry continued efforts to curb what it described as the ‘prevalence of un-Islamic practices’ in the country due to lack of religious awareness,” the US State Department claimed. The report highlighted the case of a Bangladesh national who was kept in detention for 23 days prior to deportation, without being charged with any crime. According to the report, his employer alleged that he was deported after police discovered books on Christianity in his possession. The report claimed that the blocking in the country of Hilath’s personal blog by the Ministry of Islamic Affairs in 2011, on the justification that it had anti-Islamic content, remained in effect. The report highlighted incidences of societal harassment and abuse targeted towards citizens, especially women, who do not conform to strict, narrow “acceptable guidelines”. The report claimed there had been an increased use and continuation of anti-Semitic rhetoric by public officials throughout the last 12 months. One example given was a pamphlet titled “President Nasheed’s Devious Plot to Destroy the Islamic Faith of Maldivians”, authored by a former home minister of the current administration, Dr Mohamed Jameel Ahmed. Dr Jameel was recently removed from his cabinet post by President Waheed over concerns of a potential conflict of interest after he became the presidential running mate for the Progressive Party of Maldives (PPM) – becoming a direct rival of the incumbent. “The pamphlet received wide-spread attention upon it’s release and played a role in the events that eventually led to the February 7 transfer of power,” it read. The report further refers to statements made by President Waheed, who came to office following last year’s transfer of power. “During the year, President Waheed warned the nation that foreign parties were attempting to influence the country’s ideology and promote secularism; he urged citizens to resist these impulses,” the report read. According to the findings of the report, the government interprets the Constitutional clause naming Sunni Islam as the official religion and the government regulations being based on Islamic law as imposing a requirement that all citizens must be Muslim. Stating that Civil Law is subordinate to Islamic Law, the report points out that the law prohibits the making of public statements which are contrary to Islam, leaving offenders subject to a two to five year jail sentence. Furthermore, all are prohibited to publicly discuss Islam unless by prior government invitation, and Imams are not allowed to prepare sermons without government authorisation. Several constitutional articles declare the practice of Islam as mandatory, and all schools are required to “inculcate obedience to Islam” and “instill the love of Islam” in students. The report said that any actions found to breach the country’s Religious Unity Act were subject to criminal penalties. Specific crimes included in the act, which is highlighted in the US issued report, include “working to disrupt the religious unity of Maldivians”, “delivering religious sermons or engaging in public discussions in a way that infringes upon the independence and sovereignty of the country” and “propagating any religion other than Islam”. Home Minister Dr Mohamed Jameel Ahmed has claimed it is a religious obligation to bar former President Mohamed Nasheed from contesting the upcoming presidential elections, scheduled to take place on September 7. Speaking at a rally held by Progressive Party of Maldives’ (PPM) presidential primary candidate Abdulla Yameen on Saturday (March 9), Jameel accused Nasheed of being a “coward” who ran away after resigning from power, adding that he no longer had the courage to lead the country. Highlighting Nasheed’s recent stay in the Indian High Commission, Jameel stated that “it was a shame that Nasheed fled when he was supposed to face justice,” before claiming that he would not give the opportunity for someone like Nasheed to come to power. “Nasheed of Canaryge does not have any chance to come to power. We would not give that chance [to him]. That is something we ought to do. It is both a national and a religious Farḍ (obligation),” he said. According to local media, the Home Minister stated that “if we complete that task,” God would grant success to those leaders in the upcoming presidential election. Jameel claimed the country had fallen into a “deep mess” in almost all areas, adding that the country is desperate for a determined leader who can revive the economy. He contended that Nasheed did not have the qualities the country was expecting from its future leader. “Unlike Nasheed, President Maumoon Abdul Gayoom whom Nasheed is saying that he would beat easily, had the courage to appear before police for questioning when he was called in,” Jameel said. He argued that anyone other than Nasheed possesses courage to face law and justice. Jameel – a former Justice Minister under President Maumoon Abdul Gayoom’s 30 year autocracy – has previously expressed urgency in concluding Nasheed’s trial before the upcoming elections. “Every single day that goes by without the case being concluded contributes to creating doubt in the Maldivian people’s minds about the judiciary,” the home minister said at the time. In January 2012, Jameel – who served as vice president of Dhivehi Quamee Party (DQP) – was questioned by police after Nasheed’s government accused DQP of attempting to incite religious hatred. A pamphlet released by the DQP called on the public to “rise up and defend Islam”, whilst accusing Nasheed’s government of “operating under the influence of Jews and Christian priests”. Home Minister Mohamed Jameel Ahmed was not responding to calls from Minivan News at time of press. Also speaking at the rally on Saturday (March 9), half-brother to former President Gayoom, Abdulla Yameen, claimed that there was no need to allow “outside influence” in the internal affairs of the country. The PPM presidential primary candidate said that should he be elected, he would protect the independence and sovereignty of the Maldives against the most powerful of nations. Yameen’s comments come after Nasheed sought refuge in the Indian High Commission in Male’ last month. For 11 days the former President stayed inside the high commission building, subsequently avoiding a trial hearing at Hulhumale’ Magistrate Court. The international community has since called for free, fair and inclusive presidential elections in the Maldives. Earlier this month Nasheed, who exited the Indian High Commission on February 23, was detained by police and produced at Hulhumale’ court, despite an alleged “understanding” between India and Maldives that he would be able to compete in the upcoming elections. Nasheed is facing criminal charges over the controversial detention of Chief Judge of Criminal Court Abdulla Mohamed during the last days of his presidency. Speaking at the campaign rally, Yameen criticised the Prosecutor General’s (PG) statement made on March 7, which stated that the PG did not object to delaying the trial until presidential elections scheduled for later this year are over. “The PG is not entirely an independent individual. The PG becomes independent when he executes his responsibilities in accordance with these procedures. The PG cannot say that he has no reservations in delaying Nasheed’s trial for four weeks. “The PG cannot say for instance that it is alright to put off the trial after the elections. This is something that the PG cannot say,” Yameen was quoted as saying in local media. Yameen stated that an impartial trial against Nasheed must be held for his actions, and that any other presidential candidate should be held liable for their actions at any given time. “Why can’t the foreign ambassadors accept the fact that anyone [competing for the Presidential elections] who violates the law must be disqualified. “We also might fail to meet the criteria. In such a society it is possible for us to violate an individual’s right. If so even I must spend the day in court. How can Nasheed be an exception,” local newspaper Haveeru quoted Yameen as saying. The Police Integrity Commission (PIC) has forwarded a case against former Police Deputy Commissioner Ismail Atheef for prosecution, following an investigation commission into its arrest of current Home Minister Dr Mohamed Jameel in January 2012, prior to the controversial change of government. Dr Jameel was arrested under the administration of former President Mohamed Nasheed following a request made by the President’s Office to police, to investigate allegations made by the Dhivehi Qaumee Party (DQP) Deputy Leader that the then-government of Nasheed was working under the influence of “Jews and Christian priests” to weaken Islam in the Maldives. The allegations were extensively documented in a publication released by the party, ‘President Nasheed’s devious plot to destroy the Islamic faith of Maldivians’. The repeated release of Dr Jameel – also former President Maumoon Abdul Gayoom’s Justice Minister – by the Chief Judge of the Criminal Court, Abdulla Mohamed, led to the Nasheed administration’s arrest of Judge Abdulla. PIC Deputy Chair Dr Abdulla Waheed told local newspaper Haveeru that the investigation had been concluded and that case sent to the Prosecutor General’s office to press criminal charges against the former Deputy Police Commissioner. Dr Waheed told the paper that the arrest was unlawful as the procedure Atheef applied in arresting Jameel breached the Police Act. When Dr Jameel was arrested and brought before the Criminal Court for extension of detention, Chief Judge Abdulla Mohamed ruled that the arrest was unlawful and ordered his immediate release. Earlier last month, the Chair of PIC Shahindha Ismail resigned from the commission saying that the members of the PIC were not working to achieve the objectives of the commission and that the commission had failed to hold the police accountable. “What I’ve seen in the actions of institutions is that they have been giving a lot of space for the police to act with impunity,” she said at the time of her resignation. Police have summoned Deputy President of Dhivehi Qaumee Party (DQP), Dr. Mohamed Jameel Ahmed and Council member Ahmed Ibrahim “Sandhaanu Ahammaidhy” Didi for questioning over Dr. Jameel’s claims that the government is working with Christians to undermine Islamic scholars, made on DhiTV on Sunday, January 8. The two men are being questioned between 8 and 9 pm. Dr. Jameel told local media that police intended to clarify certain information and investigate his allegations against the state, which abides by a Shariah-based constitution. “I am ready to face this,” Dr Jameel was quoted as saying. “When the government is pressured, when they deny the constitutional rights of the people, they come after anyone who questions their actions,” he claimed. Speaking at a press conference yesterday, Press Secretary Mohamed Zuhair said action would be taken against any media who complicit in spreading false rumors that damage the government to the general public. The President’s office has filed a case with the police against DhiTV. The Dhivehi Qaumee Party (DQP) has alleged that DQP MP Riyaz Rasheed was attacked last night while he was on his way home after attending a meeting. A crowd gathered around Riyaz’s car demanding he get out of it, and assaulted him when he did so, Haveeru reported. DQP today issued a press release saying it “was possible” that Maldivian Democratic Party (MDP) Chairperson and MP ‘Reeko’ Moosa Manik “was behind the attack”. “The fact that the attack came a few days after former MDP Parliamentary group leader Moosa gave a warning to Riyaz, it is possible that the attack has some connection with the warning,” the DQP claimed. “The government has repeatedly attempted to stop Riyaz from his work against corruption in this government, by trying to bribe him, threatening him and by torturing him,” the DQP alleged. “I call on the police to investigate and find out on what grounds they are making this accusations on me,” he said. Police Sub-Inspector Ahmed Shiyam said the matter had been reported to police, who were investigating.